I was noticing that my eyes had darkness under them and were a bit puffy. After applying the gel every night for a week, I have noticed dramatic results, before even reapplying. I have not noticed any of the darkness or puffiness, but I still apply the gel because I do not want my eyes to go back to what they were looking like. I have some new forming wrinkles under my left eye. I have noticed they do not appear as deep, but the wrinkles are not close to being gone yet. I'll take what I can get though with this and am happy that after a week, I have started seeing some difference. This product is one that I love and really has done what it said it would in the description! I am a fan of Vitamin C for facial products and this is another one of my favorites. 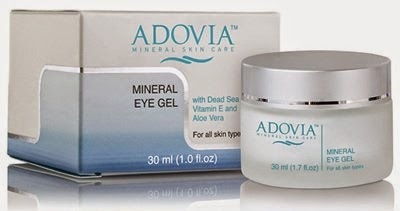 The Adovia Mineral Eye Gel can be purchased on Amazon for $29. This is a sponsored post as I received money to post my experience using the free Adovia product .